I got to go to another office this week! But this time, it was an official therapy cat visit. An accounting office in Woodland Hills wanted some therapy pets to stop by. Even though the location was pretty far from us — it took nearly an hour to get home — my human signed us up because she knew I would enjoy it. Plus I wouldn’t have to work as hard as I do with the hospital visits. The office employees had lots of fun visiting with us. There were some cat people there who really loved visiting with me, but I won over some of the dog people too. Everyone commented on how chill I was, and I gave out some high fives and impressed people by walking on my leash. (People are really easy to impress sometimes!) 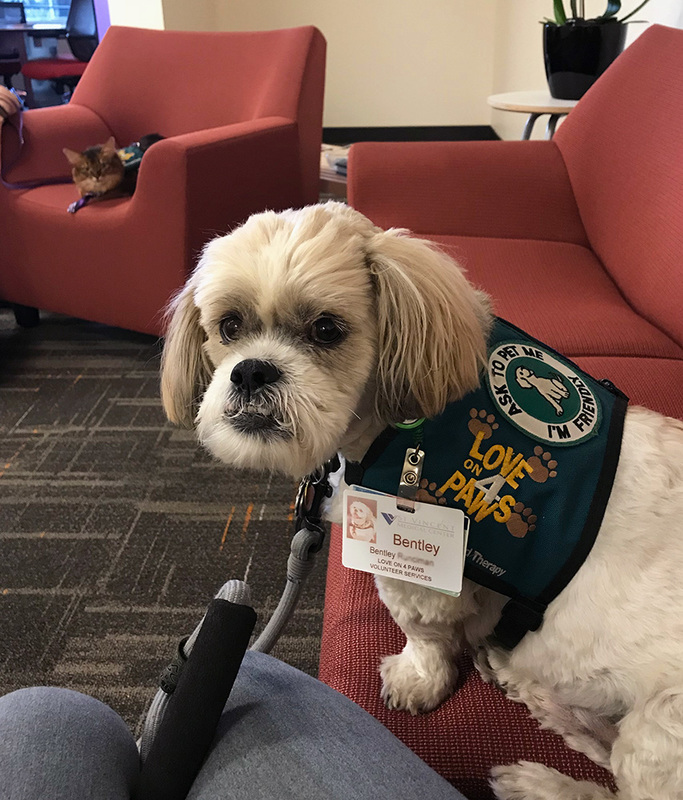 They asked a lot of questions about how we became therapy pets, and how the whole program works. Near the end, Bentley and I posed with most of the office staff for some photos. After a while, everyone had to get back to work, but we waited for a few minutes for some people to come back from lunch in case they wanted to see us. Bentley’s human took this photo of both of us. I had a really nice time! I would love to visit more offices. Besides, I have a whole bunch more neckties to wear. Sounds like a great day was had by all! Awesome! Everyone could use a pretty therapy cat! Having a kitty like you visit the office would be SO TERRIFIC, Summer! Perhaps I should mention it to our HR department…hmmm…. 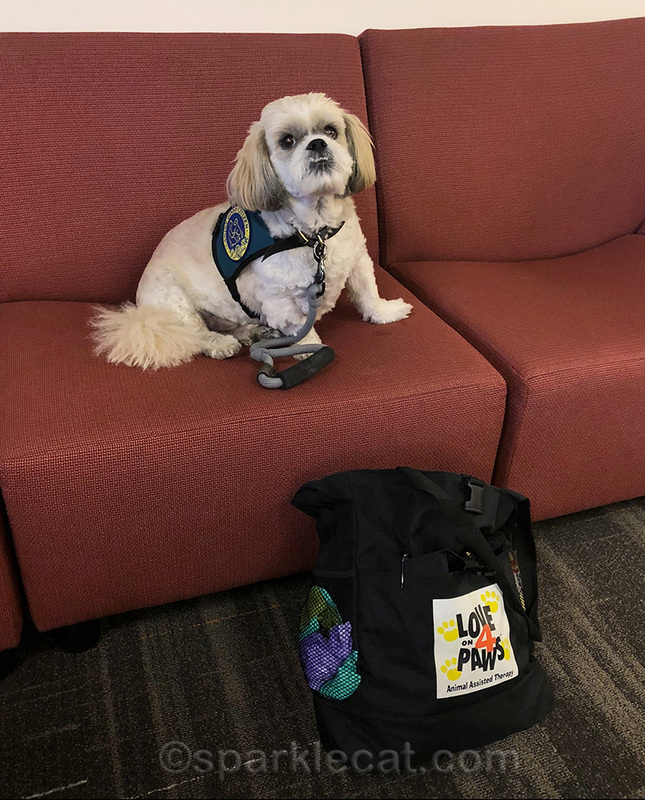 I love the idea of an office visit – offices have lots of busy and “hyped up” people working in them sometimes and a few minutes of petting a sweet and friendly anipal do them a WHOLE LOT OF GOOD. Everyone needs a little down time. You and Bentley gave those peeps a real treat! For a woofie, he’s kind of cute. The Human’s students always wanted her to bring me to school, but really: Are you kidding???? Your office visit looks like fun! I can’t wait to see more. My hairy slobbery sister Cinnamon got to go to work with Mommy when Mom was living in the apartment. She found the people walking in the hallway upsetting and would bark. So Mommy arranged to take her to work. She was pretty chill and spent most of the time in the IT Manager’s office. People LOVED to come in and visit with her too! 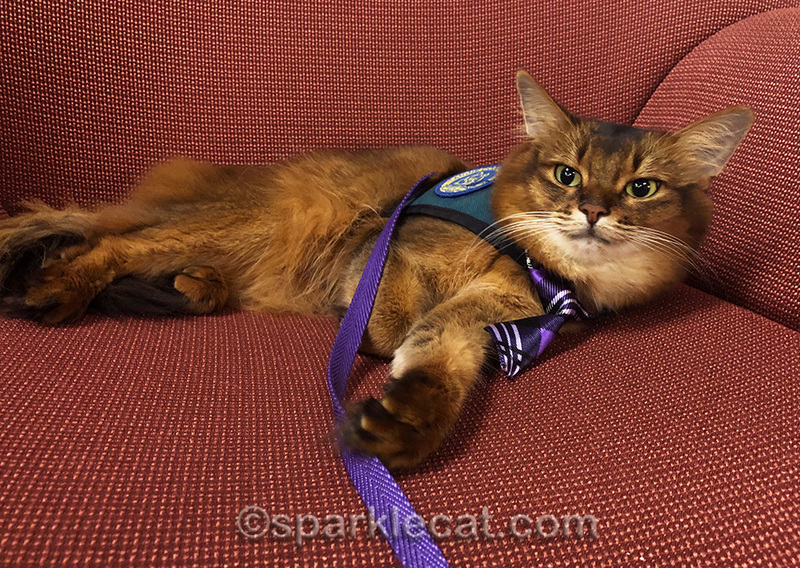 That was a a fabulous report Summer and we loved that mew wore a tie, epic! You make a great office kitty, too! 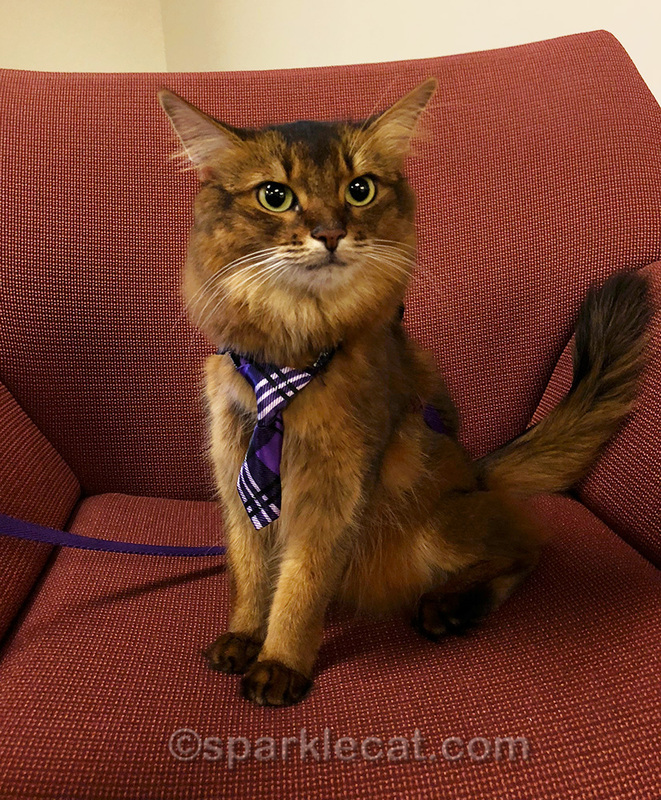 Loved that you wore a tie to the office…just like our pawppy does, MOL! 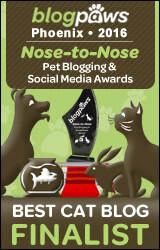 Well done, Summer (and Bentley)! We wish you lived here, so you could visit my office in NYC! You look very corporate and intelligent! I know that the accountants love having you around, Pretty Cat! I’m glad you had fun Summer. Good that you enjoyed it too. Love you got to have a wonderful time visiting the office! Love you Summer! That couch and chair sure do look comfy for you to wait. Work places can be very stressful. Sure you both helped in that department! Itâ€™s not surprising you win over dog people 🙂 I wish you could visit our office! I told my human that now that she is only working in the mornings, she has no need to all spoiled with attention from a therapy cat at work. She should be at home and catering to my needs only! Glad that you had made some progress at an office. It sounds like YOO won over the woofie, too! Summer that was for sure a power tie you selected for the visit. Bentley is a cutie. You could turn anyone into a cat lover, Summer. What a fun thing to do!! 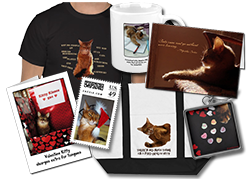 We agree….humans get impurressed easily but you really ARE special. Oh come visit me! I need some therapy! It was nice that you could visit the offices. It would make the employees day more fun. What a wonderful idea! Can you come to my office in Texas? MOL! Well, I can dream can’t I? That was a fun thing to do sweet Summer and I hope you get to go to more offices too! Summer, I wish more business offices would allow therapy animals, or even just pets! We know purring cats are calming. 🙂 I’m glad you had fun! Great job Summer! You helped relieve some stress.